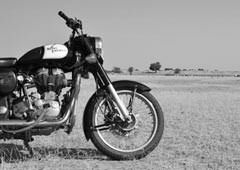 During the year 2014-2015, more than a hundred female riders embarked on a motorcycle trip with Vintage Rides. 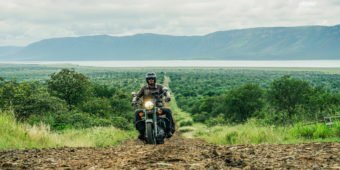 Ladies, you've been riding in Bhutan, India, Mongolia, Nepal, Sri Lanka, and now in Thailand. It is with a special thought for you that we tell the story of the world’s earliest globetrotter. 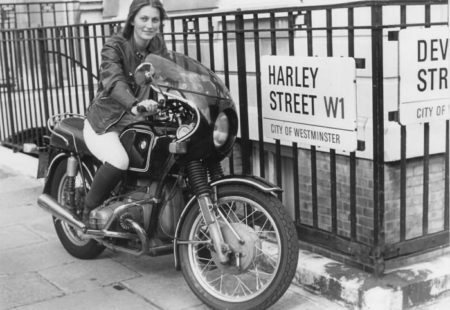 How did Elspeth Beard became the first Englishwoman to ride a motorcycle around the world? While she is studying archaeology in England, Elspeth starts to feel like discovering other places. 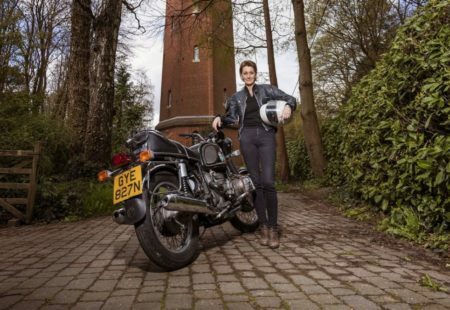 With her BMW R 60/6, which she works on alone in her garage, she travels through Ireland and Scotland, then mainly Europe. In the first two years of her bike ownership, she will rack up over 10,000 miles. This spirit of discovery will never leave her from then on, instead it starts to grow...and it grows big! It's decided: she will go travel the world after her third year of university. To get the necessary funds to carry out her project, she works in the bar of her university in the evening, after classes. After having saved enough money, she gears up and takes off to the Big Apple. 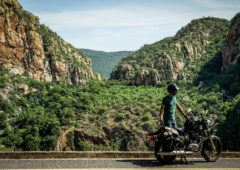 Driving her faithful motorcycle, she discovers Canada before continuing her motorcycle tour through the United States to reach Mexico. 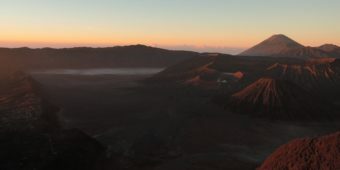 From there, she heads back up North to Los Angeles from where she embarks on a ferry across the Pacific to get to Sydney. 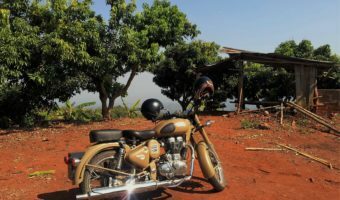 Her bike joins few days later. She spends seven months in Sydney. Along with the development of an architectural project as part of her studies, she lives in a garage and blossoms discovering the Australian roads. This time allows her to replenish her diminished funds. After a two weeks stay at the hospital due to an accident, she doesn't give up and continues her trip in Australia. She still has the Bell 'bone dome' helmet that she's convinced saved her life (and which she carried on wearing for the rest of the trip!). Her thirst for discovery strongly increases. A few weeks later, Elspeth heads to Asia. Her first stop: Singapore. 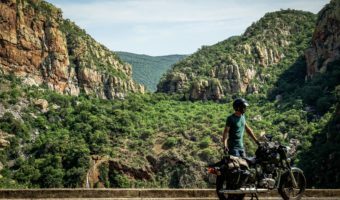 The she goes for a motorcycle trip in Thailand around the island, including a tour around Chiang Mai and the Golden Triangle mountains. “They didn't speak a word of English and I didn't speak a word of Thai, but we communicated with sign language," she said. 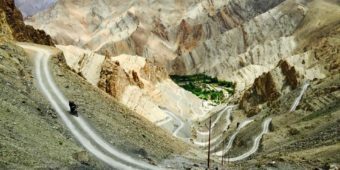 She stays in India for a couple of months and does a Himalaya bike tour, before crossing Iran in a scary post-revolutionary atmosphere. She keeps her helmet on her head while on foot, to hide her femininity: "her own burka", says the brave biker. She was then accompanied by Robert, a dutch biker she met on the way. Affected by hepatitis and severe dysentery, she rests in Turkey for a few weeks before traveling through Greece and Yugoslavia, which was under high tension at the time. Finally, the globetrotter returns to her home in England, completely exhausted. 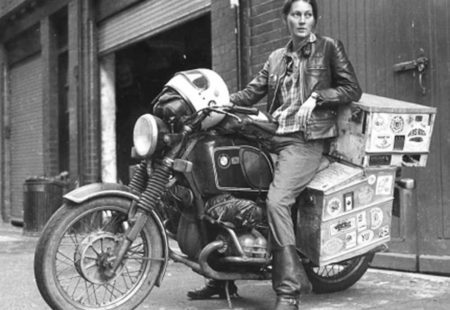 Elspeth Beard spent 3 years on the road, traveled 77,250 kilometers on a single bike and lost 44 pounds despite being only 24 years of age. Today, she still drives a motorcycle and lives on her passion for architecture. 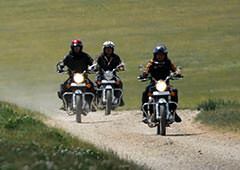 So, ladies, if you are tempted by a motorcycle tour, do not hesitate to contact us. Our girls at Vintage Rides will give a feminine touch to their advice!